Australia has a persistent gender gap in retirement savings and incomes. Men’s superannuation balances at retirement are on average twice as large as women’s. Men also have much larger non-superannuation savings. This means that women – particularly single, divorced or widowed women – are at greater risk of poverty, housing stress and homelessness in retirement. But many proposals to close the gender gap focus too narrowly on superannuation. 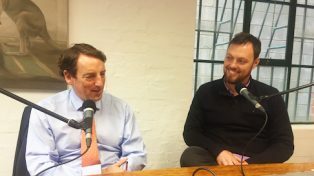 Many commentators – particularly those associated with the superannuation sector – advocate for more generous superannuation tax breaks to boost retirement incomes. Others support top-ups to superannuation savings for women, or accelerating the shift to a 12 per cent Superannuation Guarantee. But many of these proposals would do little to close the gender gap in retirement. And some, such as more generous super tax breaks, would be likely to make the problem worse. Only by looking beyond superannuation will we really close to the gender gap in retirement savings and incomes. With the Age Pension and Rent Assistance, government already has the right tools for helping women at greatest risk of poverty in retirement. It is often suggested that more generous super tax concessions would improve the ability of women to make ‘catch-up’ super contributions once they return to work. Such proposals typically take the form of increasing the annual cap on pre-tax contributions from $25,000, or replacing the annual cap with a lifetime cap. In theory, these provisions are supposed to help people with broken work histories, particularly women and carers. But very few middle-income earners, and even fewer women, make large catch-up contributions to their super funds. Less than 5 per cent of median-income earners make pre-tax contributions of more than $10,000 a year. Instead, the current generous annual caps on pre-tax contributions are predominately used by older, high-income men to reduce their tax bills. Only 234,000 women earning less than $80,000 make pre-tax contributions of more than $10,000. In contrast, almost 950,000 men earning more than $80,000 contribute more than $10,000 from pre-tax income. Carry-forward provisions – such as those the Commonwealth Government introduced recently – are unlikely to be any more effective. These allow taxpayers with a super balance of less than $500,000 to draw on unused pre-tax caps from the previous five years to make ‘catch‑up’ contributions. But a mere 2 per cent of women with superannuation balances of less than $500,000 – around 100,000 people – are expected to make pre-tax contributions of $25,000 or more in 2017-18. Most of them are among the top 20 per cent of income earners. Other proposals to provide more top-ups to the superannuation savings of low-income earners, or particularly to women, are at least somewhat targeted at the problem. In particular, the now-renamed Low Income Superannuation Tax Offset (LISTO) will ensure that low-income earners are not disadvantaged when contributing to superannuation. LISTO will cost the budget around $800 million a year. However, it is unclear that topping up superannuation accounts is the best way to improve retirement incomes for low-income earners. Measures to boost the retirement incomes of low-income earners delivered through the tax and superannuation systems are inherently less well targeted than an increase in income support payments, because they are directed at individuals, not households, and only assess households’ income, and perhaps super assets, but not other wealth. And by providing large transfers early in life, at least some of the benefits will be provided to those with temporarily low incomes but high lifetime incomes. 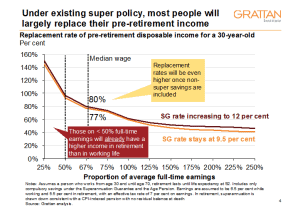 Other more sophisticated measures to boost the retirement savings of low-income earners – such as Industry Super Australia’s proposed Super Seed contribution of $5,000 to be paid automatically into the superannuation accounts of younger low-income earners – would do more to close the relative gap in retirement incomes between men and women, but at significantly higher cost to the budget. A back-of-the-envelope estimate suggests the Super Seed could cost the budget in the order of $3.7 billion a year. 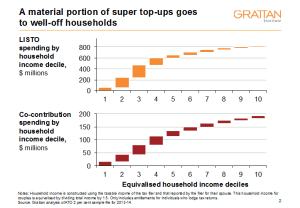 And the Super Seed proposal suffers from the same problems as other super top-ups: it focuses on individual incomes, as opposed to the income of the whole household. As a consequence, one quarter of the benefits would still go to the wealthiest half of households. The Superannuation Guarantee rate is scheduled to rise from 9.5 per cent of wages today to 12 per cent by July 2025, and there have been widespread calls to get there quicker. In particular, the 2016 Senate Inquiry Report, A husband is not a retirement plan: achieving economic security for women in retirement, recommended that the rise to 12 per cent be expedited to help women build adequate savings for retirement. standards for workers today. Therefore, increasing the Super Guarantee to 12 per cent will hurt the living standards of low-income earners, the bulk of whom are women. Raising the Super Guarantee to 12 per cent will also reduce the retirement incomes of existing pensioners. Lifting the Super Guarantee will not increase the retirement savings of those who have already left the workforce. And by suppressing aggregate wages growth, increasing the Super Guarantee will reduce the pace of increases in the Age Pension, which is indexed to overall wages. 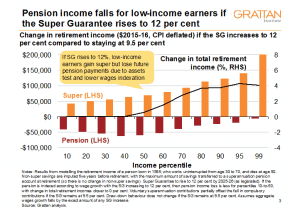 Further, increasing the Super Guarantee will deliver little in the way of higher retirement incomes to future generations of retirees, because for most households any increase in super savings will be largely offset by lower Age Pension payments. Therefore, increasing the Super Guarantee could reduce the living standards of existing pensioners, most of who are women. Increasing the Super Guarantee to 12 per cent is also unlikely to materially help close the gender gap in retirement incomes. Since Super Guarantee contributions are paid as a fixed proportion of workers’ earnings, the boost to super savings will be broadly in line with the lifetime earnings of men and women, leaving the gender gap in retirement savings unchanged. Lifting the Super Guarantee may help close the relative gender gap in retirement incomes since women currently save a smaller share of their income than men, but those extra savings will be largely offset by lower Age Pension payments. More broadly, the case for raising the Superannuation Guarantee to 12 per cent is weak. Current levels of compulsory super contributions and Age Pension are likely to provide a reasonable retirement – measured as a percentage of pre-retirement incomes – for most Australians. There are, however, two reforms which together could help close the gender gap in retirement incomes and provide a boost to the retirement incomes of the most vulnerable women. The government should better target super tax breaks to the purposes of superannuation. This would reduce the gender gap in superannuation savings. Half the value of superannuation tax breaks boost the retirement incomes of the top 20 per cent of income earners. 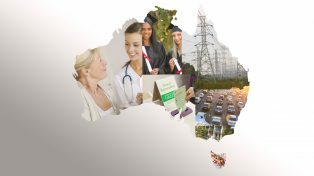 In fact, Industry Super Australia estimates that 67 per cent of super tax breaks go to men and only 33 per cent to women. As a share of total tax breaks, men therefore obtain twice the support for retirement savings as women. Three things should happen. First, annual contributions from pre-tax income should be limited to $11,000 a year. This would improve budget balances by $1.7 billion a year. And there would be little increase in future Age Pension payments, since the reductions in tax breaks would mainly affect those unlikely to receive an Age Pension anyway. Second, lifetime contributions from post-tax income should be limited to $250,000, or an annual cap on post-tax contributions of $50,000 a year. It won’t save the budget much in the short term, but in the longer term it will plug a large hole in the personal income tax system. Third, earnings in retirement – currently untaxed – should be taxed at 15 per cent, the same as superannuation earnings before retirement. A 15 per cent tax on all super earnings would improve budget balances by around $2 billion a year today, and much more in future. 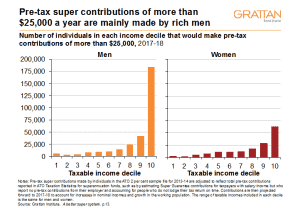 Revenue from better targeting super tax breaks could be used to provide more targeted support for retirement incomes for people who need it most, and to reduce marginal effective tax rates for low- and middle-income earners to encourage greater female participation in the workforce. The second reform the Government should introduce is a targeted boost to the Age Pension for retirees who do not own their own home, delivered as higher Commonwealth Rent Assistance. This would do the most to alleviate poverty in retirement. Single women who are retired and do not own their own home are the group most likely to rely almost solely on the Age Pension, and are at greatest risk of poverty in retirement. 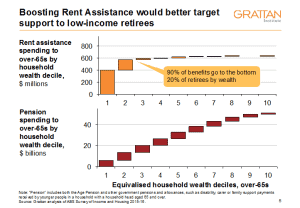 The Grattan Institute has previously recommended a targeted $500-a-year boost to Rent Assistance for Age Pensioners as the most efficient way to alleviate the financial hardship among low-paid retirees. This would cost $250 million a year. And by targeting those at greatest risk, a larger boost could be provided at relatively little cost. Such a boost could be quarantined to Age Pension recipients only, or applied more broadly across other income-support payments at a further cost of $450 million a year. 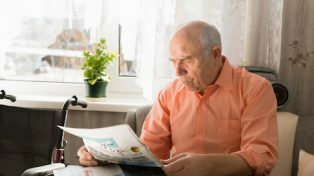 Importantly, such a boost would help people already suffering poverty in old age – unlike boosting superannuation savings, which would help only those who are yet to retire. If we’re serious about closing the gender gap in retirement incomes, we have to look beyond superannuation for solutions.